1902 Another of the earliest surviving examples of stop-motion (or stop-action) animation was Fun in a Bakery Shop (1902), a trick (experimental) film by Edwin S. Porter, released by Thomas A. Edison's Manufacturing Company. [See also 1900 entry for the earliest "stop-motion" animation.] The 80-second film was a combination of stop-action photography and object manipulation. In the short, a baker's assistant sculpted dough thrown onto the side of a flour barrel, making various faces and comical shapes - executed with smooth edits between "freezes." 1902 Georges Méliès, a magician-turned-filmmaker, introduced innovative special effects in the first real science fiction film, Le Voyage Dans La Lune (1902), aka A Trip to the Moon. This was his 400th film - a narrative fantasy of long shots strung together, punctuated with disappearances, double exposures, and other trick photography and elaborate sets. It was the first film to depict a rocket launching (into the Moon!). 1902 As a way to eliminate competition and to protect its inventions and profits, in 1898 the Edison Manufacturing Company brought a patent infringement claims lawsuit against its rivals - including its major competitor, The American Mutoscope & Biograph Company (founded in 1895 by one of Edison's past associates W. K.L. Dickson). In July of 1901, a U.S. Circuit Court in New York ruled that Biograph had infringed on Edison's patent claims. Biograph appealed the ruling, claiming it had a different camera design, and the decision was reversed in March 1902 by a US Court of Appeals. It ruled that Edison did not invent the motion-picture camera, but allowed that he had invented the sprocket system that moved perforated film through the camera. The new ruling essentially disallowed Edison from establishing a monopoly on motion picture apparatus - and ultimately on the making of films. 1902 French engineer Leon Gaumont demonstrated his rudimentary sound-on-disk Chronophone system (an attempt to better Edison's earlier Kinetophone invention) to the French Photographic Society using an electrical connection between the film projector and the turntable. Gaumont's device was a synchronized sound system using phonograph cylinders, to allow synchronized sound while viewing films. 1902 The oldest continuously-working studio facility for film production in the world is Will Barker Studios, now known as Ealing Studios (based in the UK). It has become known for many famous films, including Kind Hearts and Coronets (1949), Passport to Pimlico (1949), The Lavender Hill Mob (1951), and The Ladykillers (1955), and more recently, Notting Hill (1999) and Shaun of the Dead (2004). 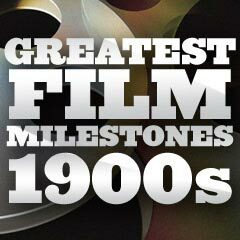 1902 Pioneering British inventor Edward Raymond Turner produced the earliest known colour motion picture film footage in some short test films, including one of his three children (Alfred Raymond, Agnes May, and Wilfred Sydney)seated at a table with sunflowers and goldfish in a bowl. Other footage was of Turner's heavily bonneted daughter on a swing, a brightly-colored macaw, a lengthy panning shot of Brighton Beach and Pier, soldiers marching in Hyde Park and what was thought to be the very first shot of traffic on London's Knightsbridge looking up to Hyde Park Corner. This would establish the claim that Turner was the father of moving colour film, pre-dating the first successful color film process known as Kinemacolor by eight years.